Transcript of “This is Your Life” special presentation at the LA meeting, June 24. As promised, we had a very special presentation at our recent Jeanette MacDonald & Nelson Eddy Los Angeles Birthday Bash on June 24. 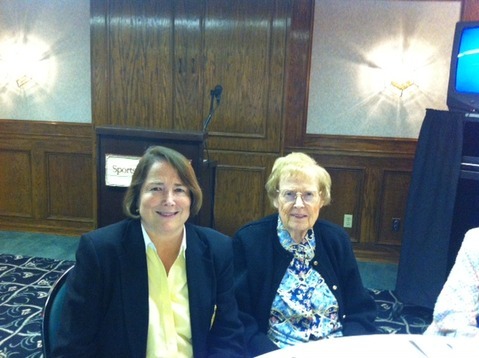 The presentation was read by Linda Tolman (left). It was written by Madeline Bayless (right), who has known of the Jeanette MacDonald-Nelson Eddy romance from the pre-Naughty Marietta days. Her father was a friend and associate of Nelson’s from his earliest days at MGM. The presentation continued with a restored screening of “This is Your Life, Jeanette MacDonald” and then a slow-motion viewing of the crucial moments of that show, and some still photos taken just after. We want to thank both women for their months of hard work putting this beautiful project together. You can download and read the transcript in PDF format. Thanks to Patrice Messina for taking the photograph. « Happy July 4th! Hear Jeanette and Nelson sing! » All CDs and DVDs 25% off with coupon code! Excellent presentation, wish I could have been there, the transcript was such enjoyable reading, beautifully done. Many thanks to Madeline for sharing her knowledge and commentary with us.